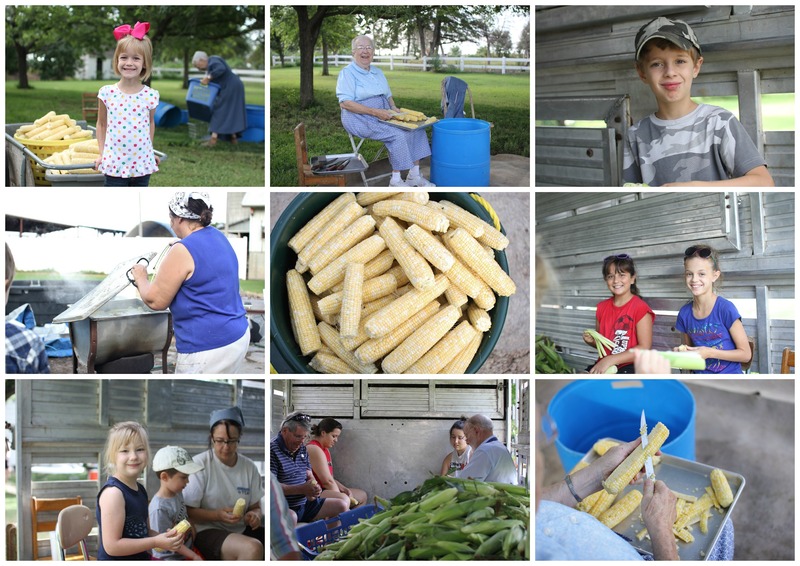 We spent 8 hours outside at Dale’s family farm doing corn on Monday. It was hot, sticky, exhausting, but FUN! If you want to know what “putting up corn” looks like, then you have come to the right place. This family has it down to an ART form! They have done this as long as Dale can remember. Some years it takes several days, others, just one full day. We have only helped a few times. Our 30 quarts lasts several years usually, because we don’t eat a lot of corn. It doesn’t count as a veggie at our house, so typically it goes in soups and casseroles instead. 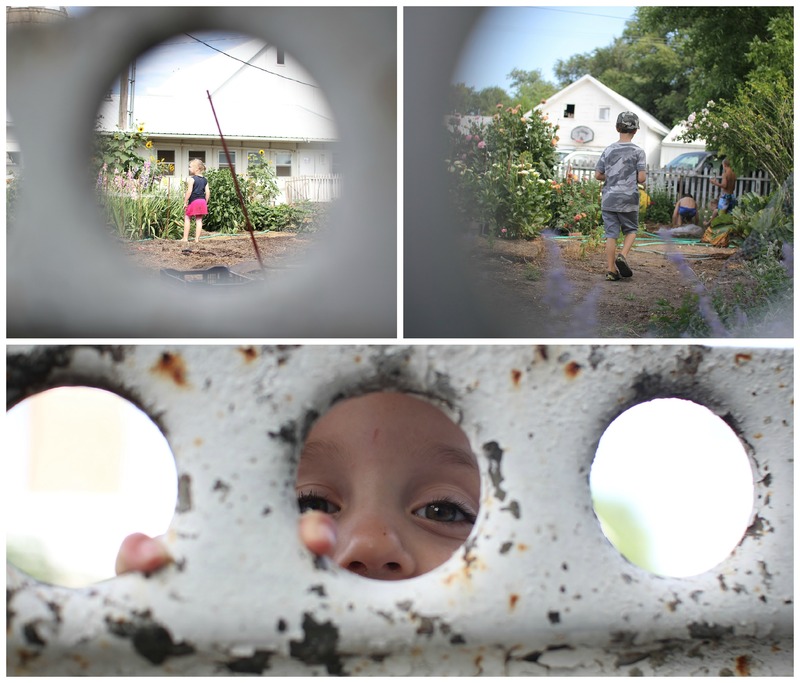 The photo on the top right is his Grandparents current home, the “Dawdy Haus,” or Grandpa House, right beside the big house. Neat, huh? Dale’s Uncle and Aunt that took over the dairy now have the big house. First things first on Corn Day. They head to the field at dawn to pick. 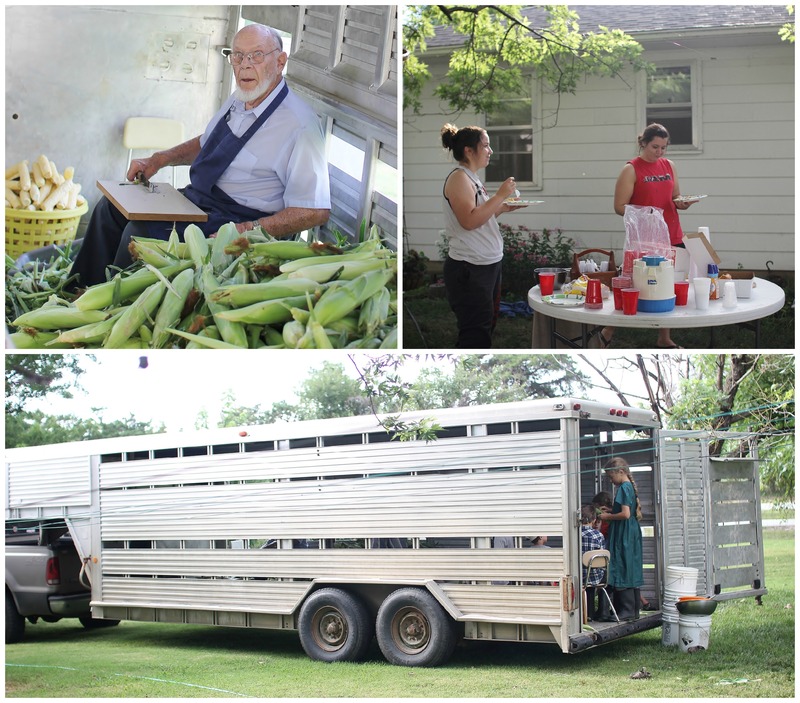 If you arrive at the farm by 8 or 9, you will find everyone sitting in the big cattle trailer and shucking the corn. And eating breakfast too. You sure don’t want to miss out on Aunt Lucy’s famous Cinnamon Rolls. 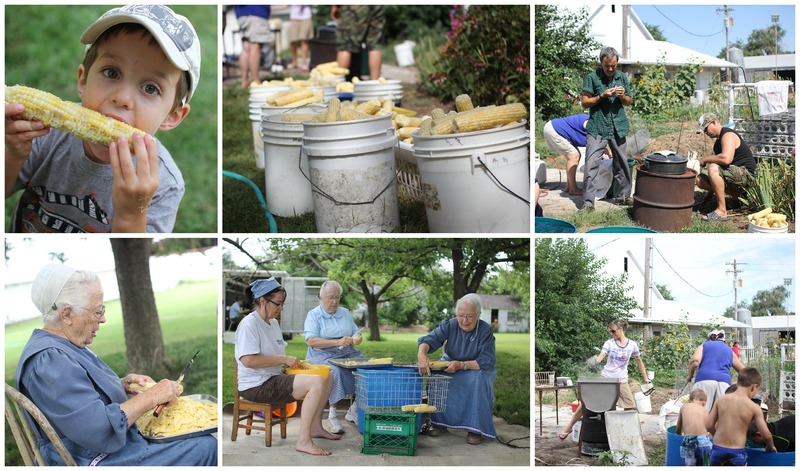 The blancher pots, and cold water stations, are all set and ready for the bins of shucked corn. This years corn is SOO sweet and juicy. The perfect tender crisp, too. THAT was a lot of corn…..check it out. The husks covered the entire bottom of the trailer a good couple feet thick! 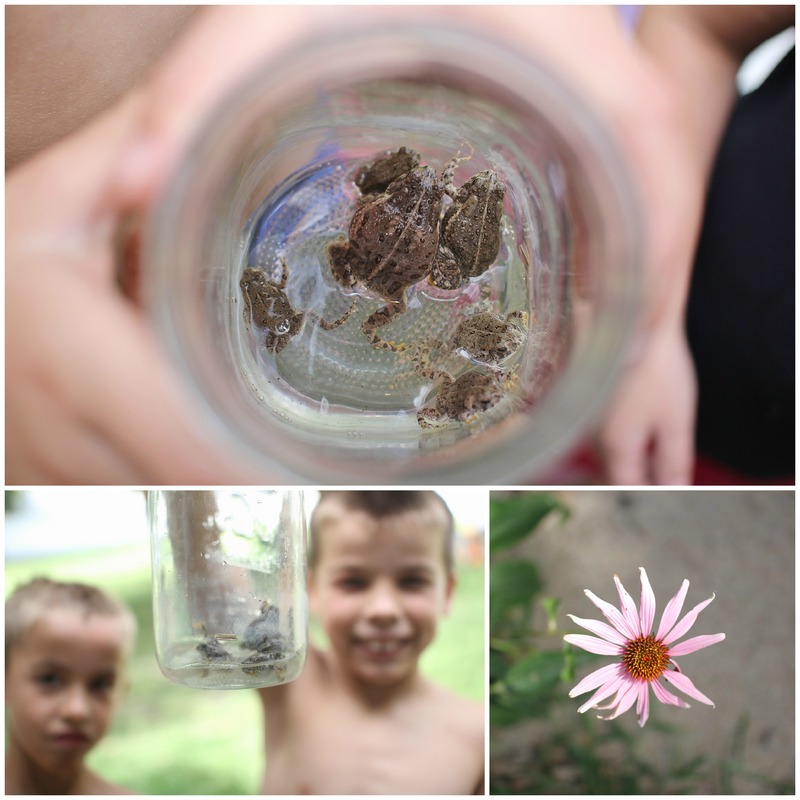 The kids worked hard, but needed lots of breaks you know, so they headed into the garden for some toad catching. We put up a total of approx. 300 quart. Not bad for an 8 hour day. I was told the record is 600 quart?! WOW. That is a LOT of corn to put up! 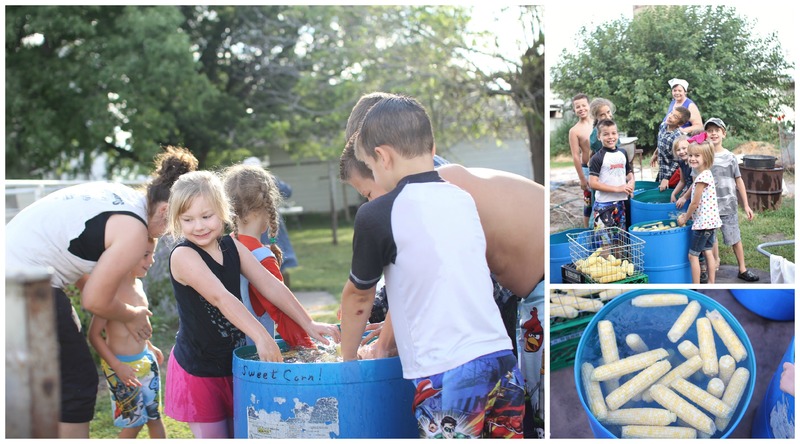 The kiddos favorite part was taking a swim when all the corn was done cooling! About the time we wanted to leave, we couldn’t find some of our kids. We found them here. In the um, muck? Ok fine, let’s be honest. It’s poop. Lots and lots of it. No honey, Daddy used to squish cow pies between his toes….BIG DIFFERENCE! The Germaphob in me cannot handle that sort of thing. It gives me the heebie jeebies to think of all the….never mind. SOOOO, now that they are totally cleaned up and sanitized, twice, let’s move on to a more pleasant subject, Mexican Street Corn. I am SOOOO excited to share this amazing, salty, fried cheese-coated corn with you! I found the recipe at Weekend Potluck, when Kathy from Kathy’s Kitchen Table came to share. You all are not going to want to skip this one. 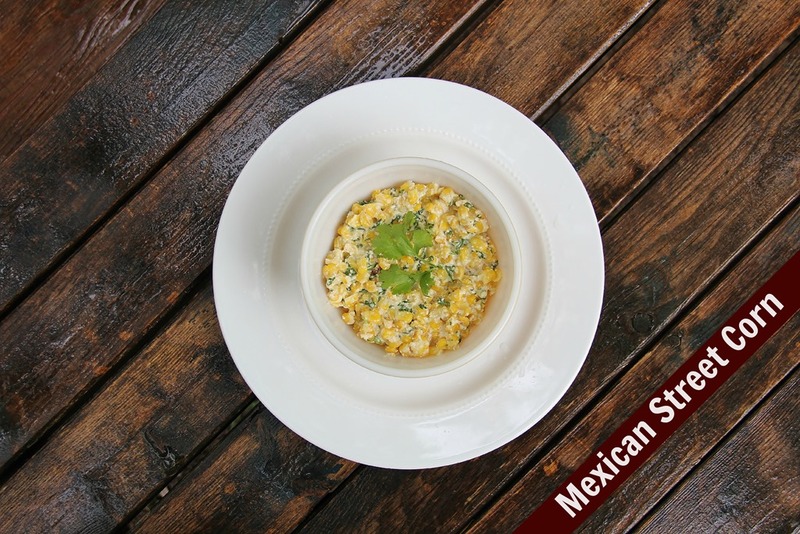 Whether you serve it as a side dish on Mexican night, or use it as a Corn Relish inside your burritos and steak fajitas, it is SO GOOD! My kids looove taco night, so I have been trying to put aside some of my new recipes, to allow them this small pleasure. HOWEVER, I am always looking for ways to make it fresh and fun. 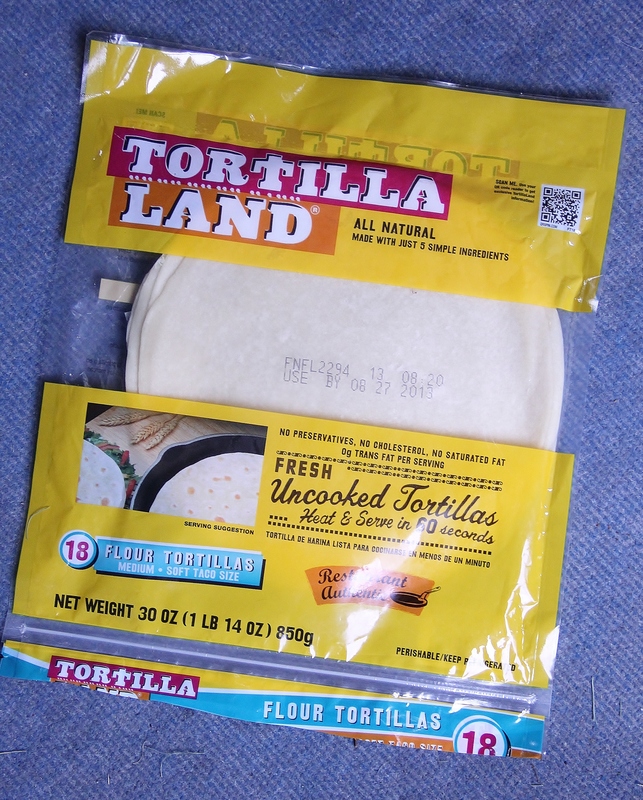 In addition to this amazing Corn, I used a new kind of tortilla that I found at Walmart by the Mexican cheeses….. They only have 5 ingredients, and the first is WHEAT flour! Happy Momma Moment!!!!! 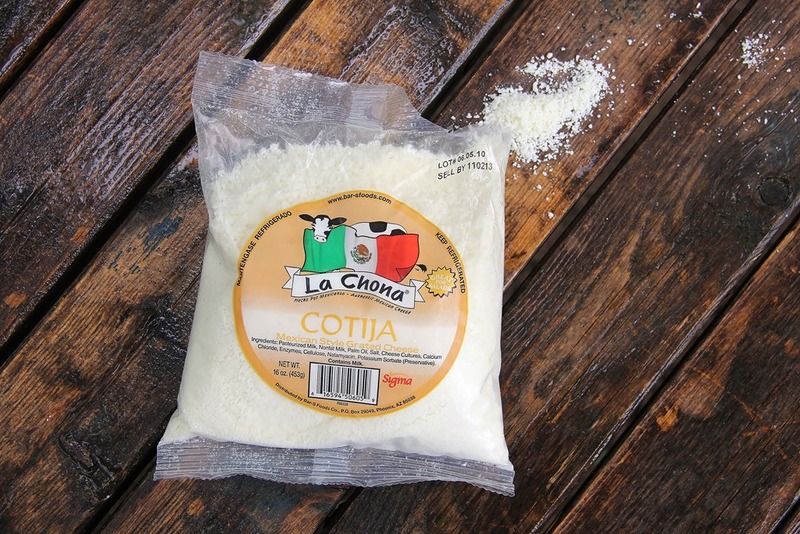 By the way, this is what Cotija cheese looks like. It was way easier to find then I thought it would be! Just by the other Mexican refrigerator items. Heat oil in skillet over medium high heat. Fry salted corn on both side until golden brown. Transfer to a medium bowl, stir in mayo, cheese, cilantro, lime juice and chili powder. Serve warm on the side, or in your favorite burrito! My Stars! That’s quite the operation! VERY productive to get that much done in one day…and what better way than to do it as a big family! Love it! Photos are awesome (all except for the poo ones=( and the recipe sounds terrific too. Thanks for sharing. Sure, I am glad you asked! 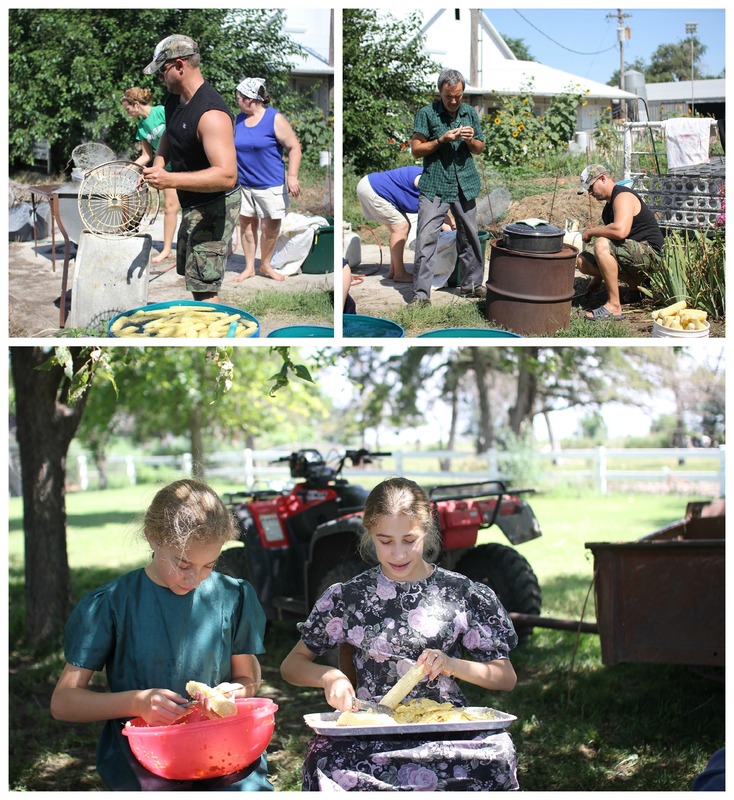 Ok, so after the corn boiled itself to a tender crisp in the large cooking pots, Dale and his aunts used one of those yellow baskets you see pictured, to fish out the hot ears of corn. 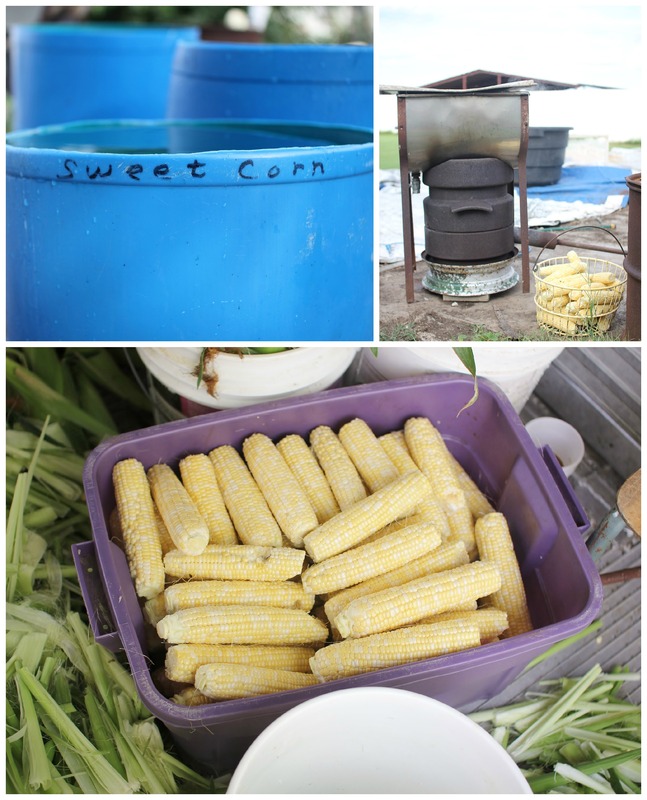 The blue barrels are full of COLD well water, the corn cobs are cooled in each one for several minutes. You can see the children dunking them, then moving them to the next barrel. By the last blue barrel, they are completely cooled and ready to be hauled over to the cutting station. The blue barrels are then filled with cold water for the next batch. Looks like a lot of fun and work! Is Dale’s family Amish or Mennonite? 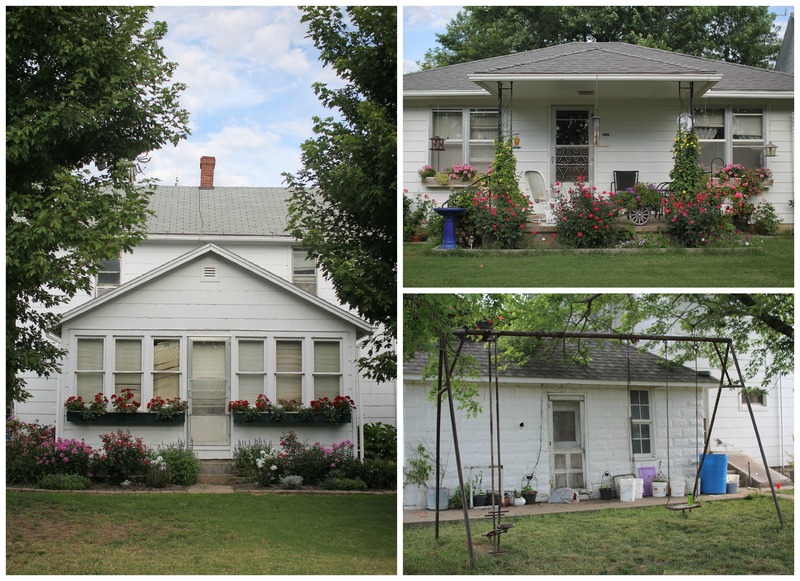 I have heard about the Dawdy house before – such a neat idea! Both Dale and I come from Amish roots, but grew up Mennonite. My grandmother left the Amish church when she was 9. Not sure about Dale’s family, but his Grandparents are Conservative Mennonite. Grandma wears a covering and a dress. They have electricity, but no tv. Car, but no radio. I LOVE the idea of a Dawdy Haus too!! Family unity, living on the same property etc. as parents age. It’s very acceptable and the norm around the Amish community that we live close to. My great grandparents farm also had one. So cool! Thanks for capturing the day so beautifully!!! I remember my Grandma helping when i was a kid. My kids all say it one of their favorite days of summer!! I loved the day “in the corn”! 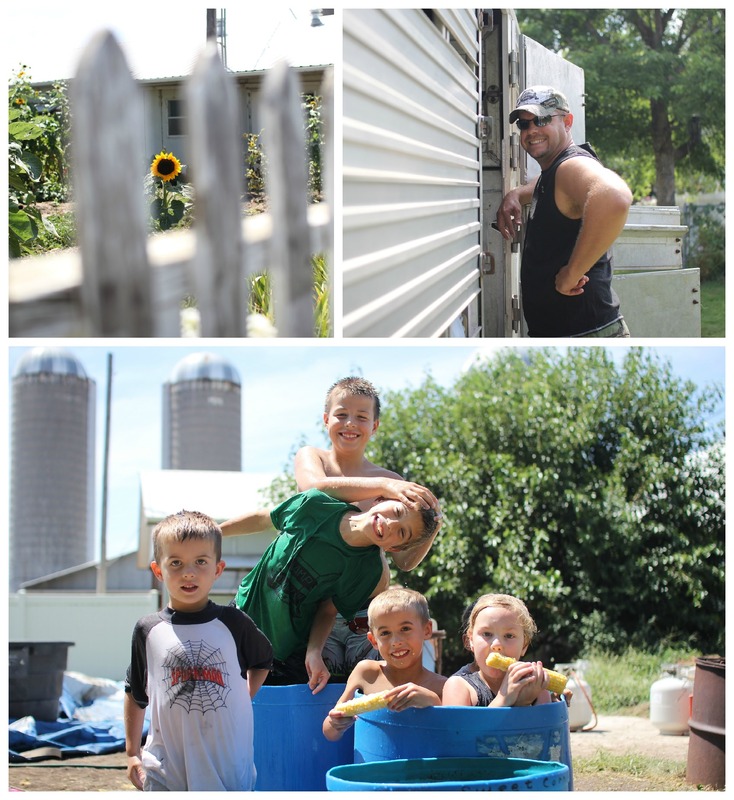 We also have a day similar…Hubby and I moved to the ‘country’ 17 years ago, to be closer to his family. Although raised in a city, (Greensboro, NC) we were both accustomed to gardening. We have had a garden for years in the backyard of our house, city or country.. Hubby also helps with a BIG family garden at his cousin’s house at the end of our road. A couple of weeks ago, he got the call that the corn was ready. 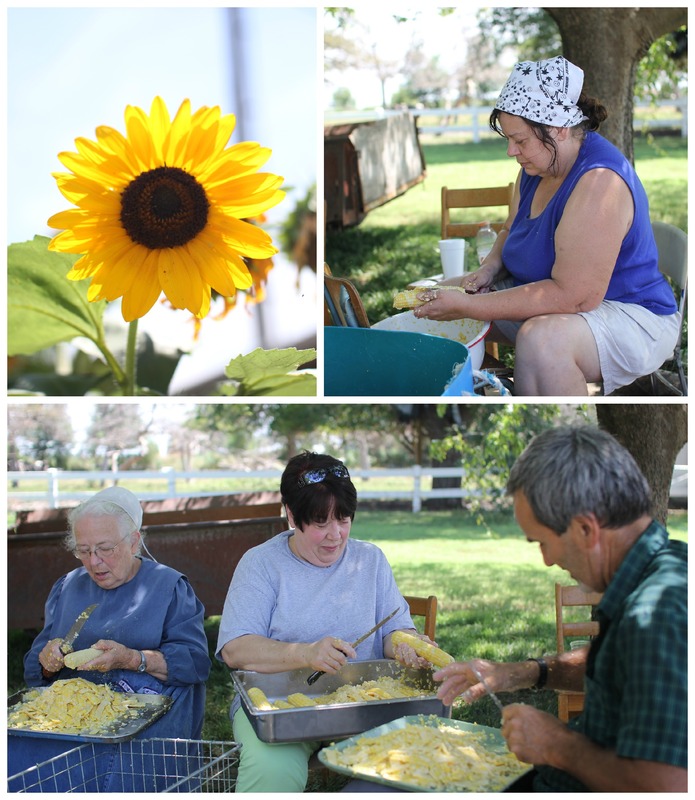 Several different families share in the bounty and at least one family member helps. We don’t have as detailed operation as yours but after the corn is pulled we decide how much corn we will need. We start shucking, silking and cutting off the ends. At this point we brought ours home. I usually cut off some and keep some whole for corn on the cob during the winter. We ended up with about 12 dozen ears of corn. I cut up about half. I don’t blanch the ears I keep whole so they will still be crisp when thawed. I do blanch the corn I cut off the cob. We can and freeze as many fresh veggies as we can. We also have potatoes dug from the garden..they usually last about 1/2 the winter. I can spaghetti sauce base/salsa, regular tomatoes, sauerkraut, squash, zuchinni relish, and green beans. 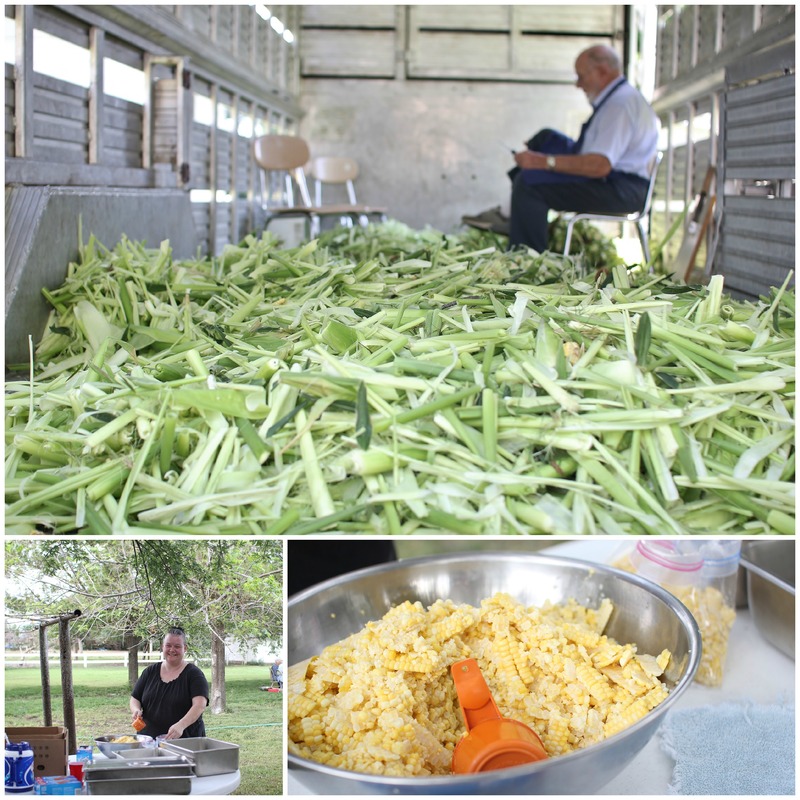 I freeze field peas, crowder peas, foodhook limas, colored butter beans, corn, strawberries, peaches, okra and bell peppers. Sometimes I make jelly and pickles. Needless to say we have a full pantry and freezer at the end of summer. A lot of work, but also a blessing and a sense of accomplishment to see all that wonderful homegrown goodness just waiting for those cold winter days. I didn’t know about your Amish and Mennonite heritage until I saw the pictures. I have always been fascinated with the Amish and their lifestyle. We love to visit OHIO AMISH COUNTRY. 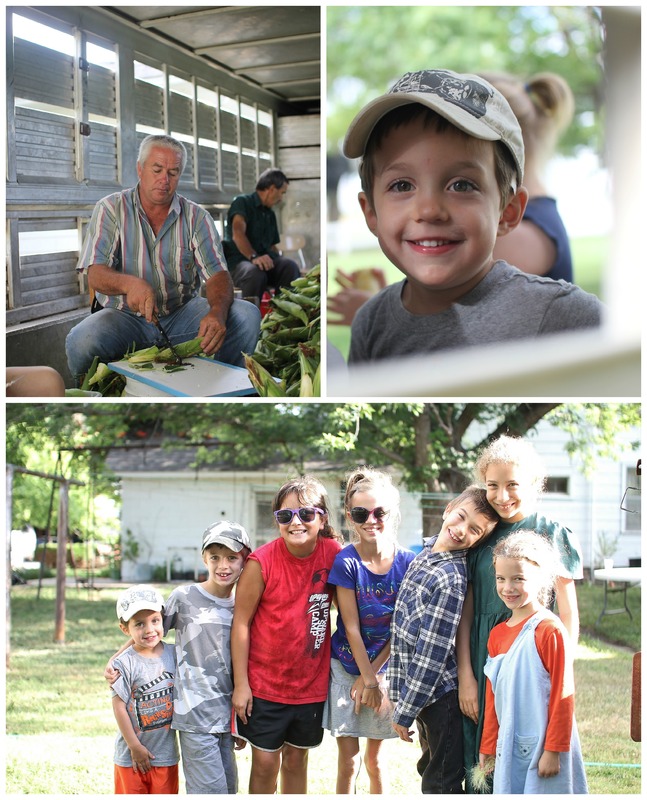 Thanks for sharing your wonderful day on the farm…It was so much fun to look at the pictures and enjoy your day with you.